An intense family drama directed by Mahesh Manjrekar. I played Amar Patwardhan, the beloved son of a middle class Indian couple. Good-hearted Amar lives and works in London but, on a visit home to India, Amar takes his girlfriend Jenny with him and the two get married. Shortly after the wedding, Amar witnesses a murder perpetrated by the son of a local minister. So begins a nightmare of false statements, cover-ups and wrongful allegations as Amar's beleaguered parents struggle to get justice. "You will probably need a large box of tissues while watching this one. I started weeping after Maheshji narrated the script to me. I'm sure the movie always brings tears into the eyes of its female audience. 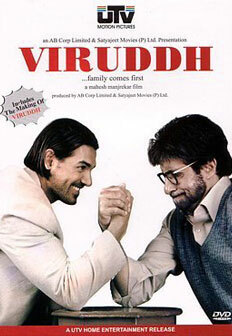 I didn't have a major role in it but I did get to work with Mr Bachchan again. Always an honour."